McCamey, Texas has been called many things over the years. Some of the nicer ones are "Child of Black Gold", "Home of the First Rattle Snake Derby", and just recently the town slogan for the 75th anniversary was "75 and Still Alive". Now McCamey has a new title. By resolution of the Texas Legislator. 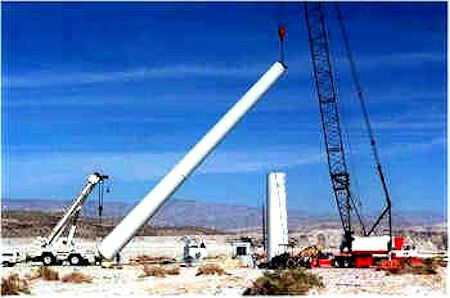 On February 22, 2001 McCamey was declared the "Wind Energy Capital of Texas"
This new title comes to McCamey honestly because it has become a hot bed of this relatively new "green" power industry. On King Mountain two companies have teamed up to provide power to Austin Energy. 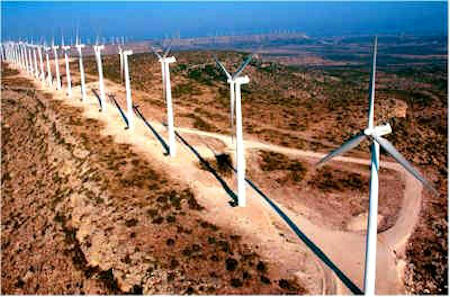 However, because demand was so strong, the number of turbines on King Mountain Wind Ranch devoted to Austin Energy have more than tripled from the original 12 to the current 59 turbines. That means the power generated will rise from 20 megawatts to more than 75 megawatts - enough to supply more than 25,000 households. Woodward Mountain Wind Ranch™, will start construction soon. Woodward Mountain is West of McCamey near Girvin, Texas All of this activity may mean a new slogan for McCamey. "McCamey goes as long as the West Texas wind blows"